The Rotary Club of Tortola has ruled the Service Clubs, Cross Country division, winning 10 straight titles and 11 overall. The most exciting finish to the annual Highland Spring College Classic Series—now in it’s 19th season—concluded on Saturday in Paraquita Bay. All eyes were on deciding the overall titles. That’s where Khari Creque and Katrina Crumpler, foiled Tarique “Tweety” and his sister Tarika “Tinker Bell” Moses’ quest to become the first brother and sister overall champions in series history. Tarique had beaten Creque who won the series opener in the last two races and a victory would have given him sole possession of the overall title and derail Creque’s bid for a fourth successive crown. Creque ran a controlled race, overhauled Tarique to win by 14 seconds in 11 minutes and 36.14 seconds, to grab a share of the title with his main rival. With Crumpler winning the last race, Tarika the second and Samantha John the first, the title was up for grabs by any of the three females. 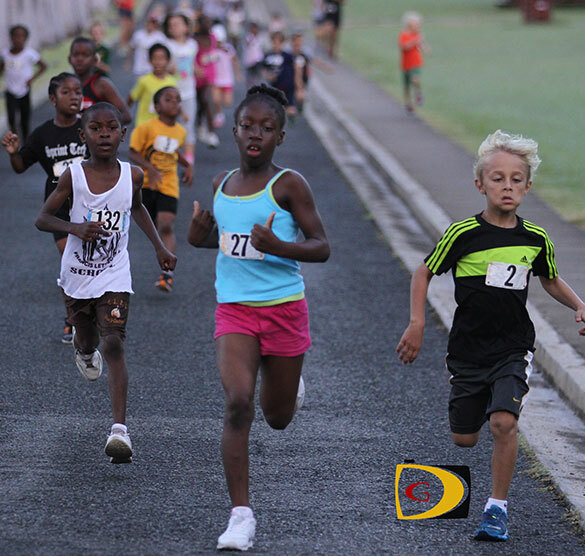 Crumpler—fresh off placing fourth in the Diva Half Marathon in Puerto Rico last weekend ahead of facing St. Thomas’ Ruth Ann David in the BVI Sunrise Half Marathon this weekend—held off Tarika’s late charge to win in 13:01.64 to Tarika’s 13:02.75. It was Crumpler first time competing in the series and says her focus is more on the longer races. “I’m quite surprised to win as I’ve never done these races before and it was nice to improve my time over the series,” she stated. 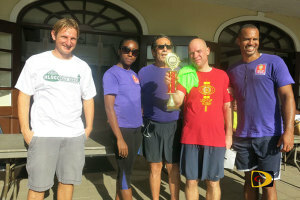 The Rotary Club of Tortola won the service clubs Cross Country division for the 10th successive year and eleven overall. Cedar Secondary pulled off a 3-peat while their parents returned to win the Community Partners division. Joyce Samuel Primary who made their debut this year, finished behind Althea Scatliffe Team I and ahead of Francis Lettsome. 50-59 Male: 1. Adrian Dale, 2. Howard Moore, 3. Elvet Dore Sr.